Gugi, or Gogi as it is usually referred, in Gulbarga district of Karnataka, lies in the Bhima river basin, surrounded by hillocks on three sides. 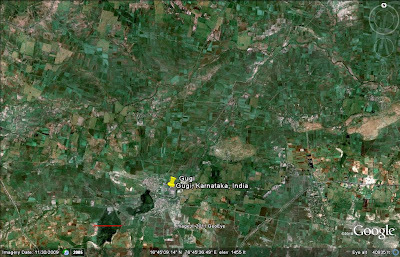 75% of the district's area is used for agriculture with Krishna and Bhima rivers draining this district. The main agricltural products of the district are Jowar, Bajra, Tur, Gram, Sunflower, Groundnut,and Sugarcane. The above 'clickable' image is created using Google Earth; red line is 1km scale. In this verdant food bowl, around Gogi, man has found Uranium. Aerial surveys and follow up mining explorations have revealed a deposit of 4000 tonnes of high grade Uranium ore. Of this, every year, 1.5 lakh tonnes of the ore will be trucked to Hyderabad 250 km away to yield 150 tonnes of uranium from the region. Two things are to be noted - that even in case of a rich deposit, every kilogram of ore gives you just 1 gram of uranium; which means that 4 million tonnes, or 4 billion kilos, over the lifetime of 15 years of this reserve will be trucked through the fields, across rivers and basins, forests, hills and living, thriving agricultural communities for processing. In its wake will follow ground water contamination, radiation pollutions, exposures, deformities, cancers and deaths..all well documented side-effects of uranium mining. Local residents in Gogi are fearful and oppose the plant, as they should, given the poor safety directives and implementation record of UCIL( Uranium Corporation of India Ltd.) Future plans include exploiting Uranium from the entire Bhima belt between Sedam to Muddebihal, about 200 km apart. Yet, these reserves are likely to remain but drops in our nuclear energy bucket. Currently India produces 450 tonnes of Uranium per year. It needs 7000 tonnes per year for its nuclear rollout. While India claims uranium reserves of 115,000 tonnes, a realistic estimate is more like 73,000 tonnes. That is, if we were to exploit ALL of India's uranium reserves, it might keep us going for about 10 years..only 10 years. So we are looking towards going from oil dependency to nuclear fuel dependency over the coming decades. Yet, none of this is preventing our government from its grandoise predictions, plannings and active implementations towards a very bright nuclear future to cover up the vast environmental destruction, human havoc, irreversible wreckage that it promises to leave in its wake. I have now taken to singing a ditty from my childhood " Yellow, Yellow, Dirty fellow.." for the yellow uranium cakes, yellow cesspools, yellow jaundiced greed..dead yellow, dirty yellow, to cover green fields, clear rivers, forested hills, blue skies..I sing this ditty and I fight!